Three hundred and sixty-four days ago, we posted “2014: The year in beer ’round here,” a compendium of the notable happenings in the local beer world. Give it a look-see — it was a heckuva year. In 2014 we covered most of those events in the late, lamented Providence Phoenix; in 2015, we covered ’em at the B&C desk. The statbot at WordPress sent us a quick snapshot: we filed 253 posts, 45 of ’em on Fridays; our longest streak was 11 days [10.21.-31]; and we welcomed readers from 103 countries. The most-read pieces [not including polls]: “The Malted Barley is coming to downtown Providence” [7.22]; “Track 84 is closed” [6.30]; and “Beervana: The beer list” [10.8]. Here’s a selection of the other standout beer news and mega-perused pieces, including a slew of exclusive dispatches. We’re [almost] always working for you at the B&C desk! Cheers to the New Year! 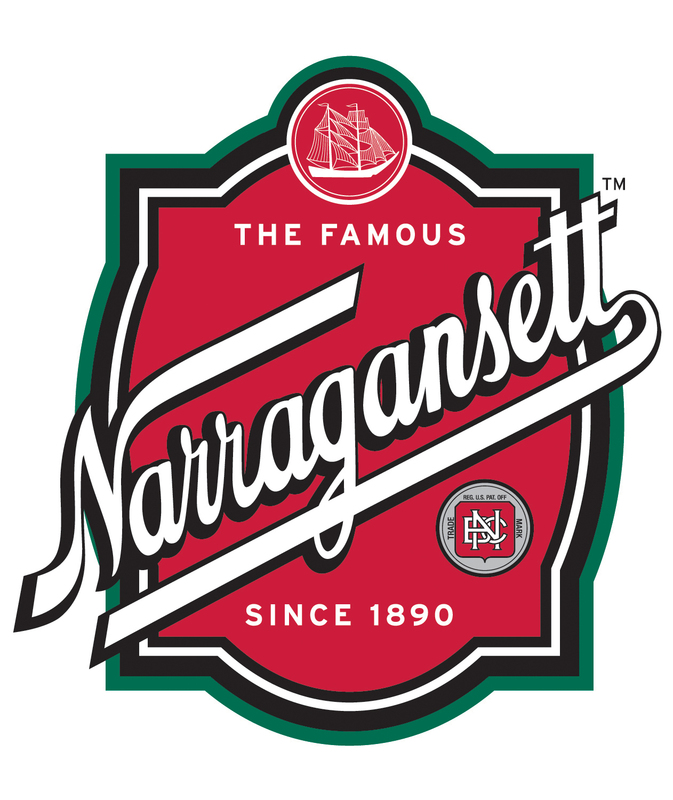 In the last decade, Narragansett has enjoyed steady and far-ranging growth: it’s now available throughout New England, New York, New Jersey, Pennsylvania, Delaware, the District of Columbia, North Carolina, Florida, Wisconsin, Nashville and Chattanooga, Tennessee, Portland, Oregon — and the UK! And it has generated huge buzz and sales with its mashup collaborations with Autocrat [Coffee Milk Stout], Del’s Lemonade, and Allie’s Donuts, and the H.P. Lovecraft series of offbeat brews [Lovecraft Honey Ale, Innsmouth Olde Ale, and Reanimator Helles Lager], which fueled a year-long celebration of the author and the brewery — both born in 1890 [scroll down for news about the last Lovecraft release]. As we did in 2014 to commemorate ’Gansett’s 124th b-day, we asked Mark Hellendrung a few questions and, once again, he graciously responded. What were your personal ’Gansett highlights in 2015? In addition to our 125th anniversary this year, it was also our 10th anniversary since getting our beer back in 2005. We’re up 10 percent in volume for our tenth consecutive year of double-digit growth. With the growth, we were able to bring on four new people, so it’s a really great honor to continue to grow year in and year out. It was also exciting to win a silver medal at Great American Beer Festival for the Lovecraft Innsmouth Olde Ale. What are your plans for the brand in 2016? 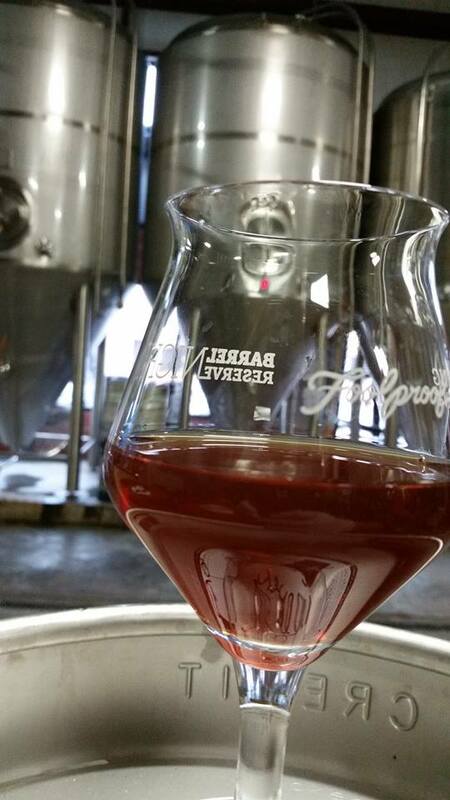 We’re excited to continue to bring new beers to consumers in 2016. The Lovecraft journey has been a really fun way to deliver interesting, award-winning beers with Sean Larkin. And in Q1 we’ll be announcing plans for the brewery, which should be the final piece in a long process that I’m sure a lot of people have anticipated, with a likely opening in late summer. We’re also going to launch ’Gansett in a couple new markets in the mid-Atlantic/Southeast, building off our great momentum in Maryland, DC, Delaware, and North Carolina. Will there be another new Del’s mashup? We have at least five concepts on the drawing board right now that we’re evaluating — some super local mashups and others involving collaborations with great craft breweries. 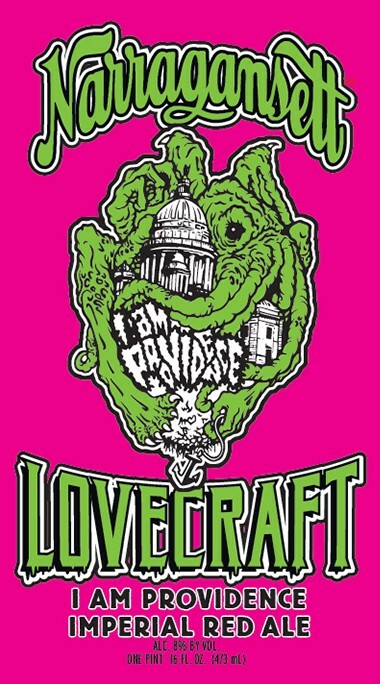 Mark gave us the greenlight to drop the news of the fourth Lovecraft beer: I Am Providence, an imperial red ale [8% ABV]. Six-packs of tallboys [with striking label art by Gunsho, aka James Quigley] will be hitting Rhode Island just before Valentine’s Day and then spreading to other markets. And the anniversary fun continues with a big bash at Lupo’s Heartbreak Hotel [79 Washington St, Providence] on Saturday, January 2 at 9 pm with Deer Tick and Last Good Tooth [tickets are $25 advance, $28 day of show, all ages]. Huzzah to Mark and alla the folks at the Haus of ’Gansett!! • On October 21, we launched the petition to “Support the passage of better beer laws in Rhode Island.” The goals: to change the law that arbitrarily and unfairly limits the amount of beer [72 ounces] that can be purchased at breweries [there’s no ounce limit at brewpubs] — which puts a limit on the income and potential growth of small brewers; and to float the notion of allowing pint sales in tasting rooms at breweries [click the petition link to read the entire pitch]. The document garnered 1165 signatures and hundreds of insightful comments. So what happens next? Brent Ryan, co-founder of Newport Storm and president of the Rhode Island Brewers Guild, told us: “The Guild is still working toward forming a strategy for legislative matters. Josh Karten from Proclamation Ale took over the vacated legislative committee chair this fall and is in the process of re-recruiting for the committee. Although we have not come to any conclusions on whether we will seek to pursue any legislative changes, we have taken the steps to create a process by which this would be considered and approached.” The legislators get back to the State House on January 5; the last day for public bill introduction is February 11 [though we understand there is some wiggle room re: that deadline]. Soooo it sounds like you, dear reader, will be bitching about the 72-ounce limit for another year. But we embrace a growler-half-full attitude here at the B&C desk, soooo [all together now]: fingers crossed for Better Beer Laws In Rhode Island in 2016!!! • Julians will host its Solstice Party on Monday [12.21] at 6 pm. The event features an all-you-can-eat buffet, music, and “an epic tap list” [click through; it’s epic!]. Admission is free with a donation of five canned goods or a winter coat. • At Proclamation Ale Company [Thursday 3:30-7 pm, Friday 3:30-8, Saturday 12-7, Sunday 12-5]: Derivative: Mosaic, Derivative: Galaxy, Broze, on for growlers/tastings, with Tendril making an appearance by Friday on the taps. Also: 750ml bottles of Adelia, a tart blonde “warehouse ale.” Bonus holiday hours: Wednesday [12.23] from 3-7 pm; closed 12.24 + 12.25; normal hours on 12.26 + 12.27; Wednesday [12.30] 3-7 pm, and New Year’s Eve from 12-4. • At Bucket Brewery [Friday 1-7:30 pm; Saturday 11 am-5 pm, with tours at 1:30, 2:30, and 3:30]: 33rd Inning Red Rye Lager, BOG Cranberry Orange Saison, Hive Mind Honey Ale, Pawtucket Pail Ale, Park Loop Porter, and Fireside Harvest Ale. Nate adds: “I’m not sure how we’ll work it, but we also still have some of the various porters [oaked, chocolate, vanilla and Whisper] sitting in kegs, a bunch of test batches, and some pilsner that was buried in the fridge and has aged very well. I’ll find some way to serve some of those up as well!” And: Bucket is doing a food drive for the Rhode Island Community Food Bank through the end of the year. “Come in any time we’re open with a non-perishable food donation and get a free pint. One pint per person per visit.” Bonus holiday hours: Monday [12.21]-Wednesday [12.23] until 6, and 10 am-3 pm on Christmas Eve. • At Grey Sail [Thursday and Friday 4-7 pm, Saturday and Sunday 1-5 pm]: Pekko Pale Ale, Mary Ann’s Ginger Spice, Great Ketch, Captain’s Daughter, Pour Judgement, Autumn Winds, Leaning Chimney, Flying Jenny, and Flagship. Plus: the third batch of Dark Star, a barrel-aged imperial stout made with cherries, which is only available at the brewery in 750ml bottles. Bonus holiday hours: Wednesday [12.23] 4-7 and 12-4 on Christmas Eve. • At Crooked Current [Thursday 5-7 pm, Friday 5-8 pm, Saturday 1-5 pm]: Extortion Eggnog Milk Stout, Oatmeal Raisin Stout, and Immorality Pale Ale. Bonus holiday hours: Wednesday [12.23] 5-7 pm. • At Newport Storm [Thursday-Saturday 12-6 pm, Monday and Christmas Eve 12-6] for growler fills: India Point Ale, Hurricane Amber Ale, and Rhode Island Blueberry. • At Foolproof [Friday 5-8 pm, Saturday 1-5, with tours at 1, 2, 3, and 4 for tastings ($10, includes three samples) and growler fills: Revery [Russian Imperial Stout; cans only], Peanut Butter Raincloud, Backyahd, Barstool, La Ferme Urbaine, Raincloud, and King of the Yard. Plus: a few leftover bottles from Barrel Reserve Night [first-come, first-serve]. Bonus holiday hours: they might be open on 12.23; check their Facebook for updates. • Tilted Barn is open on Wednesday from 5-8. Check their Facebook for what will be on tap on 12.23. • Check the website for updates on Whaler’s. 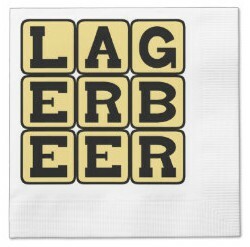 Today is National Lager Day. As is the case with many beer “holidays,” no one seems to know the origin of the stylistic celebration; the earliest online mention is from 2006. But we’ll play along! • Ales have brewed for more than 7000 years; lagers debuted in Bavaria in the 16th century. • According to a survey by Wakefield Research, 63 percent of people don’t know the difference between a lager and an ale. There are quite a few craft options for National Lager Day: the flagship beers from Brooklyn Brewery and Sam Adams, plus Heavy Seas’ Cutlass, Kona Longboard Island Lager [which won the silver medal in the Lager: Helles category at the 2015 Great International Beer & Cider Competition], Full Sail’s Session Lager, and Blue Point’s Toasted Lager [the gold medalist for Amber/Dark Lager at the ’15 GIBCC]. You can go off-road a bit and savor an India Pale Lager, which combines a bulked-up hop profile with the smoothness from lagering. Dig into Grey Sail’s Great Ketch, Samuel Adams’ Double Agent IPL, and alla the liquid splendor from Jack’s Abby. And you get seasonal with a bomber of Southern Tier’s Krampus, an Imperial Helles Lager [9% ABV] named for St. Nick’s storied horned demon who punishes naughty children at Yuletide [the Krampus tale is currently haunting the big screen at a cineplex near you]. You should also get your “Hi-Neighbor!” on and hoist a Narragansett Lager [it won the silver for Premium Lager at the ’15 GIBCC]. To celebrate NLD and share the spirit of the season, they’re running a fundraiser for Toys For Tots. 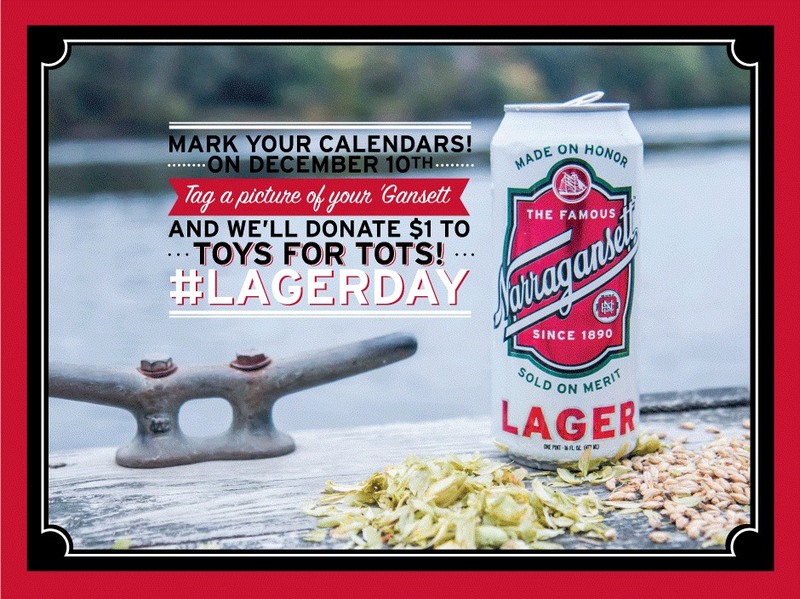 Take a picture of your ’Gansett, tag it with #LagerDay, post it on Twitter and/or Instagram, and the folks on Ship St. will donate $1 to the charity. Tell your friends! 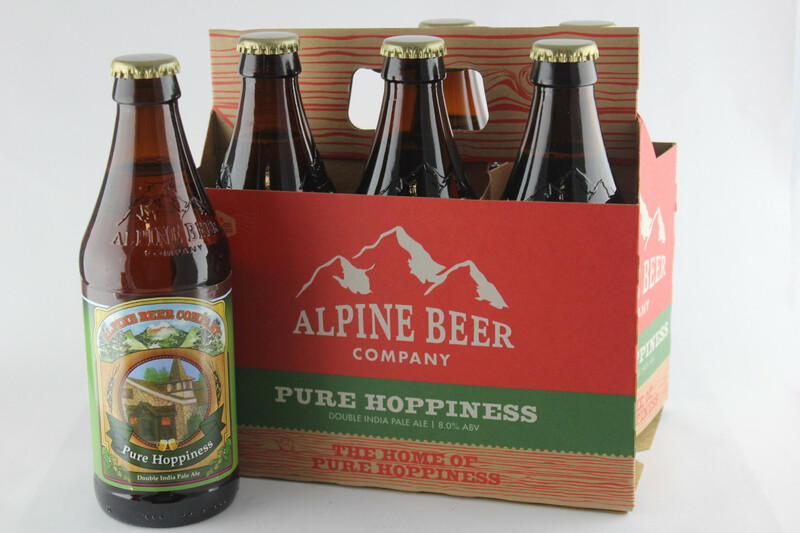 On February 23, we shared the news: “More pure hoppiness: Alpine Beer Company debuts in Rhode Island”; click the link to read about the esteemed brewery’s backstory and its acquisition in November 2014 by Green Flash Brewing Company, which boosted its production and distribution. Until now, Alpine has only been available on draft outside of California, but the ABC/Green Flash folks are delivering an early Christmas present, with the national debut of Pure Hoppiness, the revered imperial IPA [8% ABV], in six-packs. 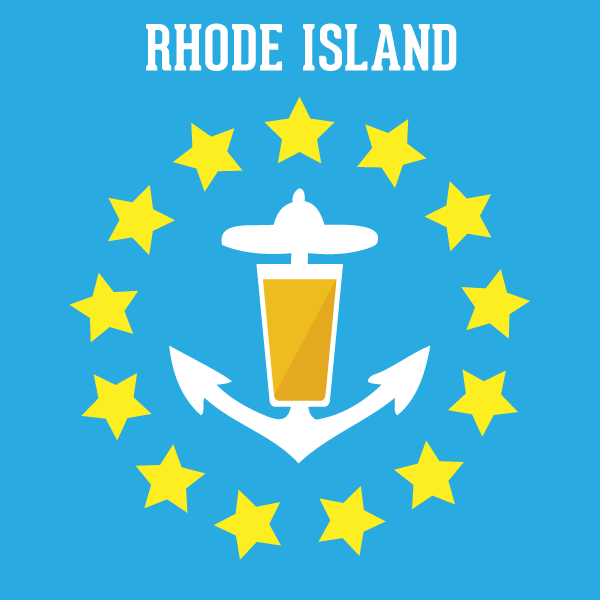 There are 12,000 cases of six-packs and 3000 half-barrel kegs in the initial shipment; Rhode Island’s allotment is “VERY limited,” sayeth the rep at Craft Beer Guild of Rhode Island [we got four of the 3000 half-barrels]. The sure-to-disappear-as-quickly-as-they-arrive six-packs are headed to South County today, Aquidneck Island on Thursday, and Providence on Friday; we don’t have specifics re: stores but, hey, you’re obviously a savvy beerist — you’re reading this #cantstopwontstop blog! — so you should be able to make very educated guesses re: the specific stores. Happy hunting! But wait, there’s more: soon come from Alpine [in February]: six-packs of Duet [IPA made with Amarillo and Simcoe hops, 7%] and Hoppy Birthday, an APA [5.25%]. Tickets are $35 [includes samples of the barrel beers and three regular Foolproof brews, plus hors d’oeuvres] and $60 [add on three take-home sample bottles!]. Click here to get ’em. Norey’s [156 Broadway, Newport] has been Tap Takeover Central this year, and is closing out 2015 with two big events. On Wednesday [12.9] at 4 pm, Revival Brewing Co. has the honor of being the first local brewery to dominate Norey’s draught lines. Brewmaster/local legend/renaissance man Sean Larkin [he #cantstopwontstop] will be in the haus and can tell you the origin stories and share tasty trivia about the featured brews: Fanny Session IPA, Conga Imperial IPA, Mercy Brown Imperial Ale, White Electric Coffee Stout, and Juliett Imperial Stout. [In other Larkin news: Sean will be front and center and working the wheels of steel at “Beat the Beast From the Yeast,” which kicks off at Pizza J (967 Westminster St, Providence) on Thursday (12.10) at 7 pm.] And on December 18, Norey’s will make merry with Holiday Beers From Around the World; we’ll have details on that awesome array of festive fare next week. • The Malted Barley unveiled its gorgeous new third floor space in Westerly on 12.2.; viddy some pretty pictures and read all about it here. And work is progressing at the soon-come Providence location; they recently posted, “Framing done, electrical and plumbing mostly complete, ceiling going in, beer vault on order, grand opening date will be scheduled soon!” We’re guessing said date will be in the New Year…aaaaand, a few minutes after we typed those words, we heard from the Bennetts: “We are about to close up sheetrock on the walls in Providence next week. Hoping to get a New Year’s Eve open but it may be a few weeks into January before we can get everything done.” Patience, grasshoppers! • Head to Chomp Kitchen and Drinks [440 Child St, Warren] on Wednesday [12.9] to celebrate “Hops For the Holidays.” Bring an unwrapped toy and enjoy a free pint of brew from Lagunitas [IPA and Fusion 32] or Left Hand [Bittersweet Imperial Coffee Stout Nitro and Wake Up Dead]. There will also be an ugly sweater contest and some sweet brewery merch. Ho-ho-go! • And speaking of #cantstopwontstop: as they did the first time around, Crooked Current Brewery took top honors in the Favorite Rhode Island Brewery Poll [with 22% of the vote]. Ravenous [20%] and Proclamation [19%] ran neck and neck and neck with CCB throughout the week, followed by Tilted Barn, Grey Sail, Revival, Bucket, Foolproof, Whaler’s, Newport Storm, Trinity, Narragansett, Union Station, Mohegan, and Coddington. Cheers to Jason and Nichole! • Proclamation Ale Company has another big bottle release today from 5-9 pm [plus Saturday 12-7 and Sunday 12-5]: Adelia, which brewmaster Dave Witham describes thusly: “Our new ‘Warehouse Ale’ is an aged tart blonde ale, fermented with our house culture of yeast and bacteria then blended with a fresh new batch of non-acidic blonde ale that is dry-hopped with Styrian Golding hops. The result? A moderately tart, dry, drinkable beer with lemon/floral notes [6.3% ABV, available in 750ml bottles only, bottle limit only restricted by state law].” Also on tap: The Stalk [double IPA made with Citra and Amarillo, 8.5%], Derivative: Mosaic [pale ale, 6%], and Broze [oatmeal milk stout, 5.5%]. • At Grey Sail [Thursday and Friday 4-7 pm, Saturday and Sunday 1-5 pm]: Pekko Pale Ale, Mary Ann’s Ginger Spice, Great Ketch, Captain’s Daughter, Pour Judgement, Autumn Winds, Leaning Chimney, Flying Jenny, and Flagship. You can also get the third batch of Dark Star, a barrel-aged imperial stout made with cherries, which is only available at the brewery in 750ml bottles. And there’s new merch: “ugly Christmas sweaters,” hoodies, and winter hats. ’Tis the season! • At Newport Storm [Thursday-Saturday 12-6 pm, Monday and Wednesday 12-5] for growler fills: India Point Ale, Hurricane Amber Ale, and Rhode Island Blueberry. • And a reminder: Tilted Barn is open on Wednesdays from 5-8, to accommodate Christmas tree sales on the weekends. Check their Facebook for what will be on tap on 12.9. • Check the websites for updates on Foolproof, Whaler’s, Crooked Current, and Ravenous.